Author: Georg Ziegelmeyer. Series edited by: Herrmann Jungraithmayr, Norbert Cyffer, Rainer Voßen. 14 pp. Roman, 240 pp. One of the common traits of almost all languages of man are constructions consisting of two clauses, where one modifies the other in much the same way an adverb modifies a proposition. Examining the aspects of these adverbial subordinations in Hausa, Fulfulde and Kanuri, three West-African languages, a central line of questioning follows the kinds of markers and constructions these languages use to specify in which way these adverbial clauses semantically modify the matrix clause. Hausa, Fulfulde and Kanuri are phylogenetically very different languages. Hausa, as the biggest member of the Chadic languages, is grouped within the Afroasiatic language family. Fulfulde is considered part of the northern branch of the Niger-Congo family. With Kanuri as a Saharan language of the Nilo-Saharan language phylum, three of the four families of languages of the African continent are represented in this work. 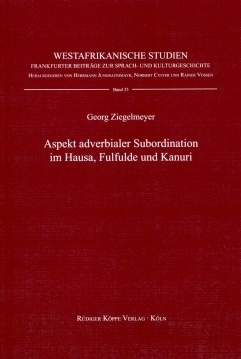 One objective of this publication is to demonstrate the ways and mechanics of Hausa, Fulfulde and Kanuri to express the semantic relations traditionally known as adverbial relations. This representation according to a semantic classification is at the same time basis for further analysis of the formal characteristics of adverbial subordinations and areal features. Further investigation is made into generalizations regarding form and function of subordinators, whether they be phrasal conjunctions, bound morphemes or of free form, or the possible grammatic categories thereof, e.g. prepositions, adverbials, interrogatives, nominals etc. Not only due to the author’s long lasting studies of the grammatical characteristics of adverbial constructions in the languages under description does the present work offer a unique view into the inner workings of language contact and areal linguistics. While historical, cultural and socio-economical aspects are not disregarded, the real focus, however, remains on the linguistic aspects of the newly found grammatical insights. The book […] is an inspiring case-study with a socio-linguistic inclination. This work provides building blocks for many further edifices. [...] this reviewer really liked the book. It deals clearly with intricate semantic domains in three languages and presents an innovative approach in the areal study of African languages, focusing on the borrowing of grammatical markers. It deserves to be on the shelf of typologists and linguists interested in African languages.